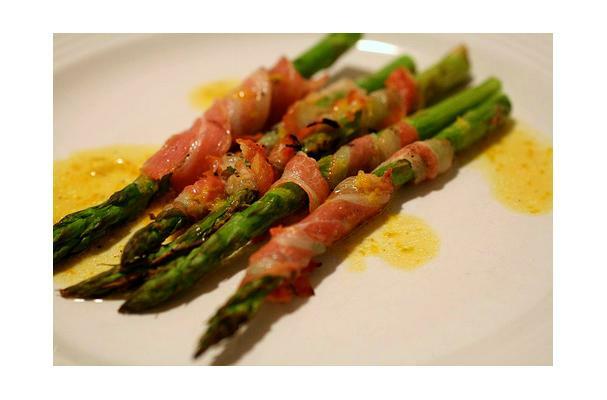 Pancetta is a dry cured meat native to Spain and Italy. It is a pork product that is very similar to bacon, but is usually sliced thinner, and is salt cured and spiced. Pancetta is pink and white in color, the white swirl patterns in it coming from the fat of the pig. It is usually sliced very thinly, and looks dry. Beverage complements: Fountain drinks, Iced teas, Anything really. Choosing: Choose pancetta to buy based on freshness, and the reputability of the market you are buying it from. Large chains probably do not offer pancetta as good as locally owned and operated markets do. Buying: Pancetta is only available in some stores, limiting the options one has for buying. Ask your deli assistant to recommend the best kind. Pancetta is prepared by salting curing and spicing pork belly, and then drying the meat for about three months. Preparation practices vary widely in correlation with where it is being made. Pancetta should be stored in a refrigerator just like any lunch meat. It will last a bit longer, though. To preserve quality, it should not be frozen.